Located on N Oracle Rd just south of Hardy Rd, Extra Space Storage serves residents of Tucson, Oro Valley, Casas Adobes, and Catalina Foothills. 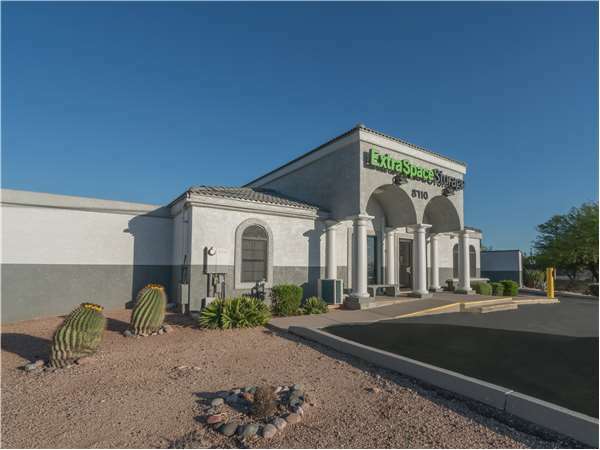 Locals will recognize our facility a few minutes south of Canyon Del Oro High School near LA Fitness and Overlook at Pusch Ridge apartment complex. With a wide range of storage unit sizes, climate-controlled storage, vehicle storage, and exceptional security, Extra Space Storage on N Oracle Rd is the solution for you in Oro Valley! No matter what you need to store, our Oro Valley storage facility has the space to accommodate you! We have units as small as 5x5 and as large as 20x25 with features like indoor access, first-floor access, and more. With an on-site resident manager, electronic gate access, and 24-hour video surveillance at our N Oracle Rd storage facility, we provide a secure environment and peace of mind for customers. Protect your items from Oro Valley's extreme heat with climate control! This amenity keeps your unit safely between 55 and 80 degrees year-round, preventing damage to your items. Climate-controlled units are available in sizes 5x5 to 10x30. Need to store a vehicle in Oro Valley? Extra Space Storage offers 10x10 to 20x25 enclosed drive-up units and 8x18 to 8x30 outdoor parking spaces, providing the indoor and outdoor vehicle storage options you want! Extra Space Storage provides dependable self storage with high-quality customer service. Our well-maintained storage facility is always clean and secure, and our friendly, professional team will go the extra mile to help you find your ideal storage solution. Contact us today to reserve a storage unit in Oro Valley! This storage facility is the best. The manager,Chris, makes the sign up process quick and simple. No worries at all. Safe and clean. Good combo! The facility is very clean and well run. The Manager is quite helpful and willing to take the time to explain how things are done. I would recommend this storage facility to anyone. Clean, efficient, friendly! A great storage place! Amazing customer service! Friendly staff and they were so helpful with my last minute need for storage. Highly recommend! Clean facilities. Chris the Store Manager is very friendly and extremely helpful! They have climate controlled units which is big in the AZ desert heat. Clean, well maintained facility. convenient for my needs. Staff is friendly and courteous. Extra Space Storage makes storing things easy. The staff is helpful, the units are well-maintained and clean and the facilities are conveniently located. I'm a happy client! -I have been using this location for business storage for over a year and accessing it almost everyday. -It is nice to have a clean restroom on location. -Staff is very friendly and helpful. -Property is very clean, orderly, and well marked. -There is a full time resident on location (security)! -There is a convenience store with fuel, next door! -And in fairness of review only real draw back I've found is that when I'm heading South on Oracle Road I have to make a u-turn to access Extra Space Storage, but not really a big deal because the road is 3 lanes wide with a big shoulder, only sometimes becomes a small issue if there is a lot of traffic. -Would definitely recommend this location to a friend or family. I have had my things stored at Extra Storage for a couple of years and am very happy with the manager and her help. In fact I recently moved some rugs from a large unit to a smaller one and the young man working there helped move them...I was in Dallas last week and was surprised to see that Extra Storage was there also. Couldn't be happier. The Oracle Rd. location is very convenient for us. The unit is air conditioned which is so important in Tucson, AZ. The site is clean and I appreciate the reminder to pay our monthly payment. It keeps me on track! Great service and very fair prices. Clean and flexible hours. I highly recommend this facility to others. Excellent customer service and when I need storage or someone needs a referral, they will get my highest rating. Clean, secure, accessible with staff that was knowledgable and efficient. This facility is located close to my home and inbetween home and work, which makes it convenient. I appreciate the various levels of security. My one complaint is in regards to the online price that was offered, which was different than the final cost. The online price did not include or mention the insurance fee. From the time I first called for information the customer service has been the model that others should try to copy. Everyone has been cheerful, expedient and competent in my transactions. The facility is kept clean and I feel secure being there. I will continue to recommend them to others. The staff at this facility are knowledgeable, friendly and proactive. They provided solutions above what I expected and information that I needed beyond vy expectations. We really appreciate the quick, efficient service in getting our extra Extra Space units rented. This is a great facility and everyone is friendly and helpful. Knowlegable people and friendly. Excellent pricing. I and family have used storage units before but they don't compare to Extra Space Storage. Spread the word!!!! very nice people working here,and they even look out for my car for me making sure the cover is back on when the strong winds blow it off. Its always clean and the security is excellent. Our facility is convenient to both home and office. Each employee has always been very helpful and able to meet our needs with a smile! When I moved out of state, I was a stranger and did not know locations of anything. Before I moved I called and a sales person helped me find the closest facility and made all the arrangements, my move was less stressful. The day the moving company arrived was a breeze, thanks to all of the employees involved. This facility is very secure and I feel very comfortable going there! It has been a year since renting the storeroom at ExtraSpace Storage. So nice to be able to go at any time during the day to get things out or to put things in storage. Perfect size and easy to get in and out. Thanks for the great service! Facility is clean and accessible. Good variety of storage sizes. Customer Service is friendly and efficient. They went out of their way to find something that would work best for me. Hours are good. Drive south on N Oracle Rd. Make a U-turn at Calle Diamante. Our facility will be immediately on your right. Drive north on N Oracle Rd. Pass Trader Joe's and continue north. Our facility will be on your right just before Hardy Rd. Drive west on E Magee Rd. Turn right onto N Oracle Rd. Our facility will be on your right just before Hardy Rd. Drive east on W Magee Rd. Turn left onto N Oracle Rd. Our facility will be on your right just before Hardy Rd.